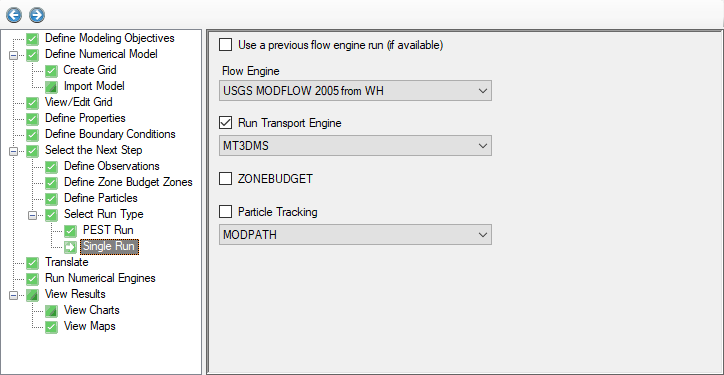 •Flow: MODFLOW 2000, MODFLOW 2005, MODFLOW-NWT, MODFLOW-LGR, SEAWAT, or MODFLOW-SURFACT (MODFLOW-USG is handled through a separate workflow). Please Note: if SEAWAT is the selected flow engine, then it will also be a required transport engine as SEAWAT is a coupled flow and transport model. Similarly, MODFLOW-SURFACT is the selected flow engine and transport is active, then MODFLOW-SURFACT will be the only available transport engine as it is a coupled flow and transport model. To run a simulation with any of the above numeric engines, be sure to select Run from the top menu bar of the Run section and the Engines to Run window will appear as shown in the following figure. Note: SEAWAT will only appear if the Flow type is set to variable density at the Define Modeling Objective step, in which case, it will be the only available flow/transport engine. The MODFLOW engine can be run by itself without any requirements from any of the other engines. The MODPATH engine requires a valid .BGT file to be present in the project folder. This file will be automatically created if MODFLOW and MODPATH are mutually selected. The Zone Budget engine requires a valid .BGT file to be present in the project folder. This file will be automatically created if MODFLOW and Zone Budget are mutually selected. The button will run the selected numeric engines using the required (translated) data files already present in the project folder. If the required files are not present in the project folder, the numeric engines will not run. A warning message will appear indicating that the Visual MODFLOW files will not be translated prior to running the model. Press the button to start the simulation. When the run completes, the Heads, Drawdown, Fluxes, and Water Table nodes will be added to the Output folder on the model tree. A saturation node will also be added if an unsaturated flow model is run (using MODFLOW-SURFACT or the UZF package).